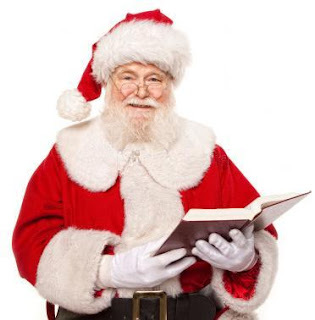 Publish America Scam: PublishAmerica Send Your Book To Santa Claus! PublishAmerica Send Your Book To Santa Claus! With the holiday season upon us you know what that means. The legendary Santa Claus is making his list and is checking it twice! Everybody knows that Jolly Saint Nick is one of the biggest book readers in the world today. In the image of our very own Co-founder Willem Meiners Santa Claus became rich and famous by purchasing and piloting his own aircraft to spread happiness and joy and to inspire those around the globe. Santa and his elves are responsible for carefully choosing the books that he delivers every year to every home the world. Santa Claus has an extensive contact list from talk show queen Oprah Winfrey, to pop music superstars Lady Gaga and Justin Bieber and Harry Potter A-listers Emma Watson, Daniel Radcliffe, and Rupert Grint. Last time we dropped J.K Rowlings name and found out she didn't like it much so here's hoping the actors don't mind us dropping their names in our ads. We're not waiting for Santa to ask for your books because that would never happen. PublishAmerica will urge Santa Claus to include your book when he loads up his sleigh this year. Our delegation will meet with him at his workshop at the North Pole next week and we will show him your books and ask him what he thinks. If you want to have books on hand, order now, and we will donate as many copies as you tell us to. And you receive a 10 pct discount! Minimum order is 100 books. Hardcovers are included! Go to www.publishamerica.net, find your book, click on it, then add to cart, indicate quantity, and use this coupon: Santa4real . In the Ordering Instructions field, just write: "Media Yes". Our PR department will automatically contact you for names and addresses of your local news media. Everybody will know that you the PublishAmerica author still believes in Santa Claus and better still believe that Santa will deliver your books on Christmas morning. Mention your book title(s). You must choose a shipping option to activate the service. DISCLAIMER: PublishAmerica has no affiliation with Santa Claus, Saint Nick or anybody named in this solicitation beyond that of a regular publisher/bookseller relationship, without preferential access or other special treatment. No specific result from PublishAmerica's best efforts to represent and promote its authors and their books is suggested or guaranteed. Happy holidays from all of us at PublishAmerica Scam! Publish America send your book to the Biebs. What a scam.